We'll likely see the Lumia 1520, but what about a rumored tablet? What will it be Nokia? 1520? Tablets? Both? Update: It appears that Nokia is planning a pretty big show come Oct. 22. Sources told The Verge that there will be six (yes, six) Nokia devices presented at the event. If the claims are true, then the company deserves some applause for keeping such a tight lid on the four mysterious gadgets. The two we suspect will show up are the Lumia 1520 phablet and the purportedly newly named Lumia 2520 tablet, formerly codenamed Sirius. Tune back to TechRadar on launch day as we're sure to have the announcement covered inside out. 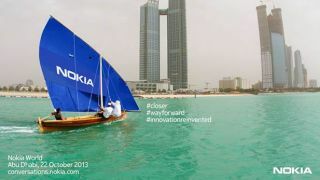 The sand dune teaser image from a Tweet last week was just a sliver of a hint, as today Nokia confirmed it's hosting a Nokia World event Oct. 22 in Abu Dhabi, capital of the United Arab Eremites. Aside from naming the city, event details are still sparse. However, it's likely that the rumored 6-inch screened Lumia 1520 will finally be unveiled. The phablet would be the first from the Finnish firm, along with the first to reportedly hold a full HD display and quad-core processor. The 1520 would also be the first release since Microsoft bought Nokia's device division, a reality that may be hinted at with the hashtag "wayforward." Tablets also on the horizon? A Nokia tablet codenamed "Sirius" is also making the rumor rounds with details claiming the tablet will boast a 10.1-inch full HD IPS display, 2GB of RAM, up to 10 hours of battery life and come with 32GB of native storage expandable via microSD. Perhaps we'll see the Sirius join the Lumia 1520 in the Nokia World announcements. It sounds like a long shot, but it could also be a big day of firsts for Nokia. Microsoft has announced the Surface 2 and Surface Pro 2.